6 months, 4 weeks ago Edited by Ray on Sept. 24, 2018, 10:53 a.m. Lately I've been working on tools development on my new company: raylib technologies. All tools have a GUI but most of them are primary intended to work from command line to process data, so, I was investigating "standard" command line designs. 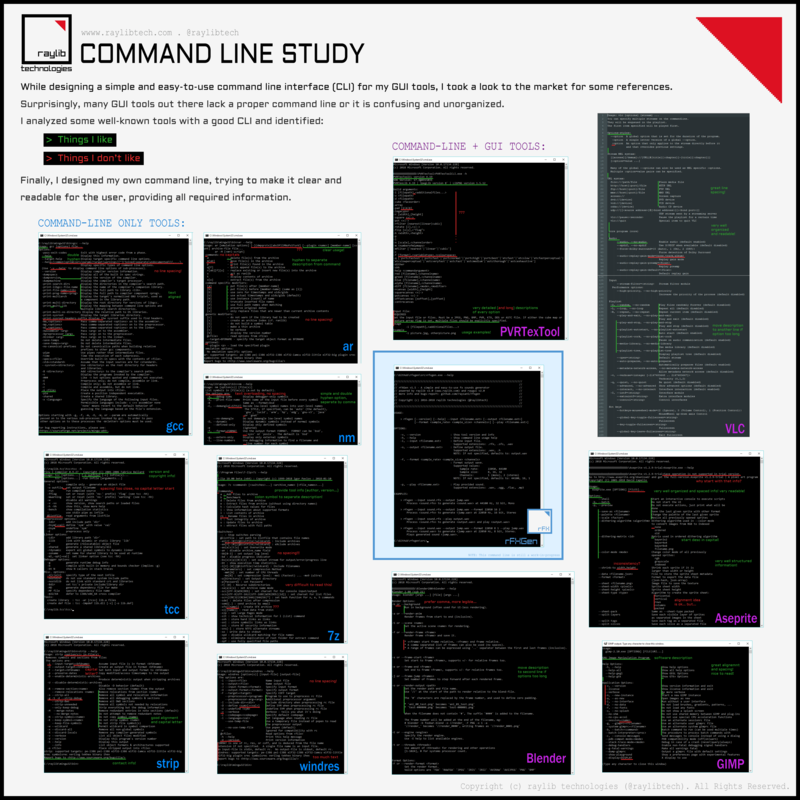 Surprisingly, there is not a clear standard and lots of command lines out there are difficult to read and understand, not to mention that most GUI tools lack a proper command line. I analyzed several tools, in my opinion, with a quite good CLI, to design my own standard for my tools suite. rFXGen tool is my testing tool for command line implementation. Any feedback on command line design is very welcome! I remember RAD video tools for having a pretty explicit command line help. Their choice of writing it in a dialog box instead of the command line itself can be argued, especially when you are explicitly launching it from the command line, but it has the advantage of not quitting instantly when you double-click the executable (if you don't know it's a command line tool yet) (That can be achieved with "PAUSE" under windows anyway). But the actual text is pretty helpful and consistent. Thanks for the reference to RAD tools, I checked them and CLI it's quite good also, they seem to mix it with some GUI options, interesting... Personally, I prefer the double iphem -- style for options instead of the /X Windows style. Also prefer the pure command line mode instead of the windows info panel. In my case, all my tools have a GUI, so, if opened with a double click or by one-file drag&drop, GUI mode opens automatically. Thanks for the feedback on > symbol... personally I like it, let's see what other people think about it. 6 months, 3 weeks ago Edited by Mārtiņš Možeiko on Sept. 25, 2018, 6:20 a.m. Most open-source cli utilities targeting Linux have good CLI in my opinion. 3) order of arguments is not relevant. 5) supporting -- in cases where arbitrary string needs to be passed as value, so it can include - or -- in it. 6) preferably supporting "response files" - @file.txt will make it read arguments from file.txt. Mostly useful on Windows which has limitation on how long command-line can be (8192 for cmd.exe, 32767 for CreateProcess). Most of these come from fact that they use getopt or argparse in Python. llvm/clang has pretty cool system for arguments, their parsing and displaying help. Although it is pretty heavy C++. I don't like the big header at the top. It contains information that I would not search for in the help. I would rather display them in a --description option or something like that. More specifically the version number and description are OK for me in the help, the rest isn't. I like console output to be small so I can still see what was before in the console in case it was relevant for why I looked at the help. The > at the beginning of lines seem unnecessary to me too, as well as the : in front of the descriptions. Why does -f and -p have a blank line above ? Did you have "rules" or do you just try things until it looks good ? mmozeiko, mrmixer, thank you very much for the feedback! mmozeiko, I actually followed some of the common Linux CLI rules. I'm not usign getopt or argparse, I'm just parsing the command-line by myself. mrmixer, personally I like the header at the top but I know it's not common in most CLI tools... -f and -p have blank spaces to separate the information from some previous NOTES. I added for better readability. Did you have "rules" or do you just try things until it looks good? Well, doesn't seem to be standard rules out there so I defined my own rules checking what other tools do that I liked. And yes, I tried until I find I formula that looks good. I think it looks good and informative! Unfortunately the '>' and delimiting ':' don't really float my boat either, though. Personally I'd try a '•' for the examples, if the line break between each one doesn't give enough separation.